Dimensions 66' by 48'11" by 14'8"
The P-61B added pylons for four 250 gallon (946 liter) drop tanks or four 1600 lb (726 kg) bombs. Some of the early production aircraft lacked the dorsal turret. The P-61C had R-2800-73 engines. 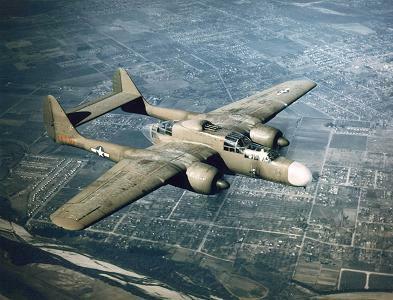 About 16 were converted to unarmed weather reconnaissance P-61G. The P-61 was the first aircraft ever designed from the ground up as a night fighter, using the experience of the earliest radar-equipped RAF night fighters. It carried the new SCR-720 airborne interception radar in its nose, and its main armament sat well back on its central nacelle. It had a large fuel capacity and was fast and agile for its size. The aircraft derived its nickname, the Black Widow (a poisonous North American spider), from its all-black finish. The dorsal turret was remotely controlled and could be aimed from the front or rear positions of the aircraft and fired by the pilot. This turret was omitted on some of the early P-61B models because it created turret buffet. This problem was solved halfway through the P-61B production run and the turret was restored. The pylons added to the P-61B allowed it to carry as heavy a bomb load as some medium bombers. Though the aircraft was introduced quite late in the war, due in part to difficulties working the bugs out of the SCR-720 installation, there were several P-61 aces in the Pacific. 56% of P-61 crews were deployed to the Pacific or Far East.